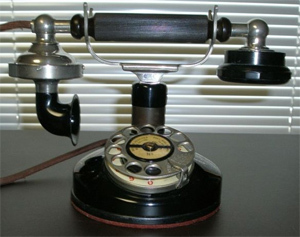 The Grabaphone, modeled after French made telephones, was the first phone to include the receiver and transmitter in the same unit, placed in a cradle atop the phone. It was called Grabaphone because you could just 'grab it' with one hand and be ready to talk. For comprehensive information on Kellogg phones, see Mike Neale's Kellogg Page.